Briefly looking back to the prison, Carl helps let Rick, Maggie and Glenn drive back in. Rick checks with his son about how things have gone at the prison and then walks off to kill walkers at the fence. Flashing back to the present, Rick finds himself broken and bloodied against the side of a car out in the woods, alone. Out in the woods, Rick’s group sits by the fire and chats about how hungry they are. Rick agrees that they should check the snares before heading out to Terminus. Feeling that it is only a day or two away, Carl thinks about how they can share who they are. Struggling with revealing too much of their past, they get interrupted by a walker. Michonne takes it out. 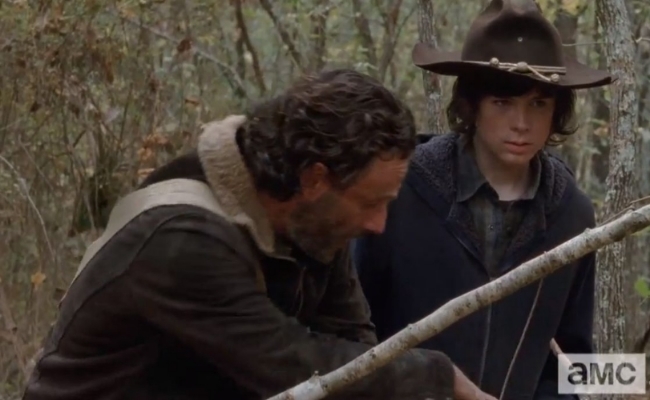 Up ahead, Rick pulls a rabbit off a snare and then teaches Carl about how to set the trap. Suddenly, they hear yelling in the distance. A man is stuck in a field with walkers all around Rick stops Carl from shooting leaving the man to die in the mob. The walkers spot them, but they run away. With just a couple of walkers ahead, Rick runs up to stab the first one in the head. Flashing back to the prison, Hershel wakes up Rick to take him on a task. Beth takes Judith while they head out. They finish taking them out and continue to run. Searching for a house or signs of food, they come across a car and a lone walker. Choosing to camp at the car, Carl gets some sleep while Rick and Michonne chat about the harsh world they live in. Rick continues to believe that they are close and they will be welcomed. A branch breaks in the woods, but nothing reveals itself. Just when they settle back down, Joe and the marauders show up and hold a pistol to Rick’s head. All three of them are held hostage but Daryl reveals himself from behind the car. Daryl stops Joe’s countdown and tries to reason with Joe. He offers himself instead of Joe killing Rick. Joe gets angry and sends his men to rough up Daryl. Carl gets dragged out of the car, but Rick speaks up to try and take all of the blame. All of their initial attempts to break free fail, but Rick finally builds up the strength and takes a bite out of Joe’s neck. Distracting the rest of the marauders, Michonne turns the gun pointed at her head on out of them and then kills one who is beating up Daryl. Free of the beating, Daryl takes out another one. Rick then turns his attention to the one hold Carl hostage, takes a knife, moves toward him and guts him. Carl watches which being held in Michonne’s arms while Rick takes out his rage on the final marauder. Back to the flashback, Hershel talks to Rick about farming and trying to start a garden. Hershel says that he needs the help because he cannot do the work himself. Rick struggles to see himself as able to let his guard down, but Hershel pleads with him to take a simpler turn after all of the chaos they have experienced. Hershel admits that Rick has done so much and is owed a debt. Rick tries to get ready to go on a run, but Hershel continues to say otherwise. Stuck in his thoughts after the events of the previous night, Rick sits bloodied against the car. Carl and Michonne are inside trying to rest, while Daryl tries to take car of Rick. Daryl admits that he did not know much about them other than that they were bad and lived by a code. He talks about how he ended up with the group and how Beth went missing. Daryl starts to quietly blame himself but Rick tries to redirect the anguish. He welcomes Daryl back to the group, calling Daryl his brother. Daryl tries to console Rick for his anger the previous night, but Rick admits that the anger is part of him and justifies it as his way to protect Carl. 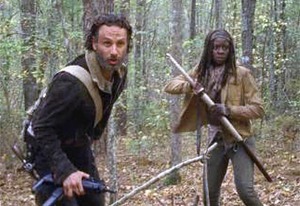 They continue on their journey and Rick tries to check on Michonne. Though a little wary, Michonne admits that she is okay because Rick is okay. They sense they are close and head into the woods to finish their trek. 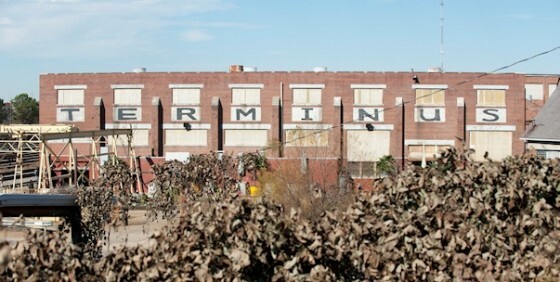 Coming up to the fences outside of Terminus, they spread out to spy on the buildings. Rick tries to ask Carl to stay close but Carl turns him down and goes with Michonne. She takes a moment to tell her story about Andre’s death. Mike and Terry had gone with her to a refugee camp. She had been out on a run, when she returned and saw the destruction of the camp. Mike and Terry were high when they died, so she took her anger and turned them into her walker pets. She calls herself a monster and how she was lost until Andrea, Rick, and Carl helped her find her humanity again. She helps him rethink his fear of his father. Carl admits that he has continued to struggle with bad thoughts and that he feels like he is a monster underneath. Michonne hugs him while Rick watches in the distance. Rick prepares his guns and buries a bag of them as Daryl returns. Jumping over the fence, they hold their weapons at the ready and move in on Terminus. They find a room with people sending out signals. Rick interrupts the room and tries to introduce themselves. Gareth introduces the Terminus crew and confirms that they have found sanctuary. Gareth asks the group to lay down their weapons, which they comply to. After a search, Gareth continues to say his welcome and returns their weapons to them. Following Gareth between the buildings, he talks about how they have been around since the start of the turn. They get a chance to meet Mary near the grill. She prepares some plates for them, but Rick sees something in Alex’s pocket. He pulls out his gun, holds Gareth hostage, and asks about where he ended up with Hershel’s/Glenn’s watch. In another flashback. Patrick is playing with some building blocks while Carl is off to the side cleaning his gun. Seeming a little distant, Rick tries to talk to him about needing help with the something and puts down his gun. In a final flashback, Rick, Carl and Hershel are farming, while Beth is caring for Judith. Rick gives Beth Carl’s hat. They feel good about the calm. Reaction: The season finale definitely did not disappoint. It was full of surprises, gore, and suspense, all of the things that have made this season so fun to watch. With all of the guessing prior to the premiere of this episode it was anyone’s game of who would make their exit from the series. It was nice to get a little return of Hershel, but there are plenty of questions still hanging in the balance. Rick has been suppressing his brutality throughout the season. He started with farming and trying to accept a calmer lifestyle, but the Governor drove him back to accepting his anger. The flashbacks in this episode served as a chance to revisit a time when Rick transformed into the flamer version of himself. He was weak for a while after the attack on the prison, but protecting Carl rose the surface. He needed to make the change from protecting his son’s humanity after Carl shot the boy outside the prison to protecting his life from the harsh world they were thrown back into. When Michonne rejoined the group, they found their struggles periodically but were able to survive and have a little more of a lightheartedness, minus the close call with the marauders at the house. Their vulnerability did not wait for their arrival at Terminus, but rather with Joe’s ambush on the road. Rick was forced to watch his closest family get held at gunpoint and beaten, leaving him with virtually no options. Joe was not going to give him a choice, but he unwittingly reawakened the brutal side of Rick. Getting to Terminus, Rick continued to be wary and with just reasoning. 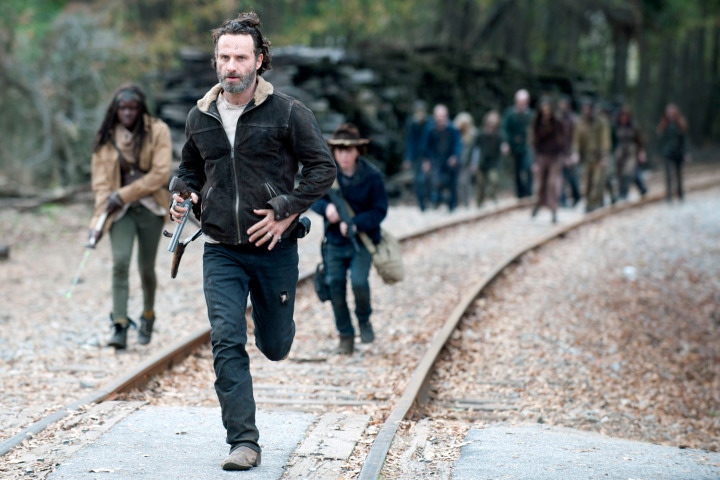 At the end of the episode, he was left to have that moment with the group about finding a way to survive and the intense, action-oriented Rick had officially reemerged. Carl went through some rough issues in this episode. He realized that he had been going through something since they were back at the prison. He killed the kid outside of the walls, saved his father from walkers, and been actively supporting the group in their travels to Terminus. The attack left him feeling vulnerable again and he was unable to defend himself. Watching his father go made with rage, he saw the monster that was possible in him as well. Carl was not afraid of his father, as he was able to see Rick come down after taking brutal measures for the group of his loved ones. He just does not know if his father will accept a similar brutality in him after all of Rick’s attempts to save Carl’s humanity. The moment where he unequivocally agrees with Rick at Terminus about being justified with having to kill was a moment of acceptance of his father’s actions but also an attempt to hide some of the other fears he was having. Michonne’s story may have helped, but Carl may still have some issues to deal with next season once they survive Terminus, assuming they all do. Michonne finally revealed a bit more of her story, but it was done without the actual flashback. She explained that the walkers that she had in chains were her former family, but they were also failures in protecting her son. It would be very interesting to see that flashback if they have a chance to fit in into the show. Regardless, Michonne has taken to being a guardian to Carl, as she comforted him multiple times this episode. She has acted more like a friend but may actually treat him more like her nephew or even her son once they get clear of Terminus. Daryl’s development was a little light, but his breakaway from the marauders and newfound brotherhood with Rick was a nice touch for the episode. The whole second half of the season was building up to this discovery of Terminus and what the characters were about to encounter. At the end of episode 15, Glenn’s group had finally arrived and it seemed like a lovely place. Rick and company did not seem to trust it so quickly. They were willing to appear like they were putting their guard down, but they were mentally ready for it to turn bad quickly. The questions about the reality of Terminus have not truly been answered yet. It is clear that Terminus is not a good place to be. It may have been at one time, but it looks like they have dealt with a lot of death and they were prepared for Rick to change his mind about accepting their false kindness. Terminus could be comprised of the cannibals from the comics. It could just be a community that has lost faith on the outside world and any survivors that present themselves. They will probably make that more clear within the first couple of episodes next season. It would be a shame not to break down the results of the incident with the marauders. Joe got the jump on Rick but clearly should have fired immediately before Daryl threw off his concentration. Rick’s moment of insanity was glorious. It brought back the question that has appeared a few times throughout the series of whether the survivors are all that different from the walkers. Rick’s ability to survive hinged on him taking a page out of the walker handbook. Joe’s group was not the cannibals from the comics, but they possessed some of the qualities of that group. They lacked humanity, but rather survived off of a heartless and selfish set of rules that did not allow for outsiders to feel like they had a chance. Rick took his opportunity to give his family a chance to survive. Terminus has presented itself and Rick is ready to enact revenge on his captors. Season five looks like it will have an explosive start and likely a few losses that had originally been predicted to take place in this episode. There are still questions about the other survivors, including Beth, Carol, Tyreese, and Judith. I will continue to post periodically but probably not weekly with the show on break until the fall. Keep following, commenting, and voting in my Walking Dead polls.